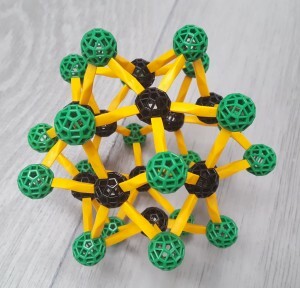 Recall the goal from last time: to build the structure pictured, except that each of the balls should be a regular icosahedron and each of the yellow connectors a regular octahedron, attached face-to-face with the neighboring icosahedra. 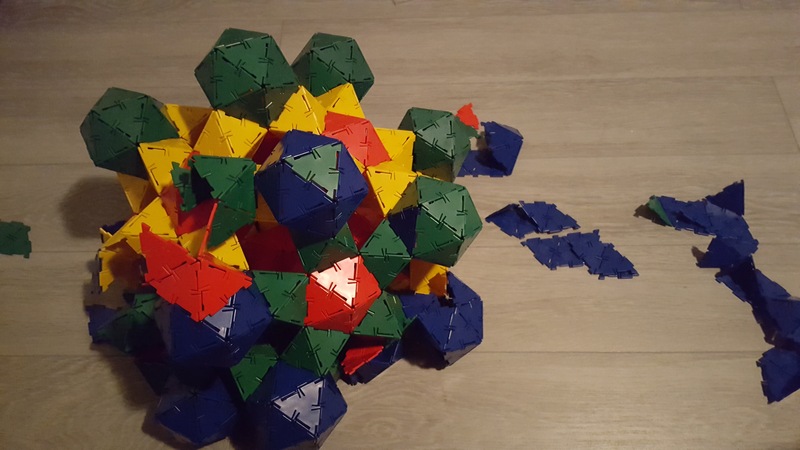 Naturally, my first thought was to use the PolyPuzzles pieces to do this. But a stint of working on this led me to consider the statistics. The (centers of) the outer balls in the structure (the green ones in the picture) lie at the vertices of a regular dodecahedron, and each of the black balls lies at the center of the corresponding face of that dodecahedron, but slightly nearer the center of the overall structure. 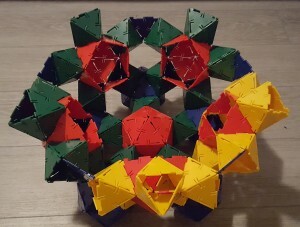 The separations between centers of connected icosahedra are all identical. 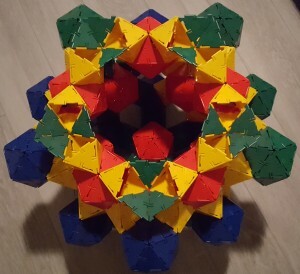 That means the overall form of the structure is that of an excavated dodecahedron, with one icosahedron per vertex and one octahedron per edge. 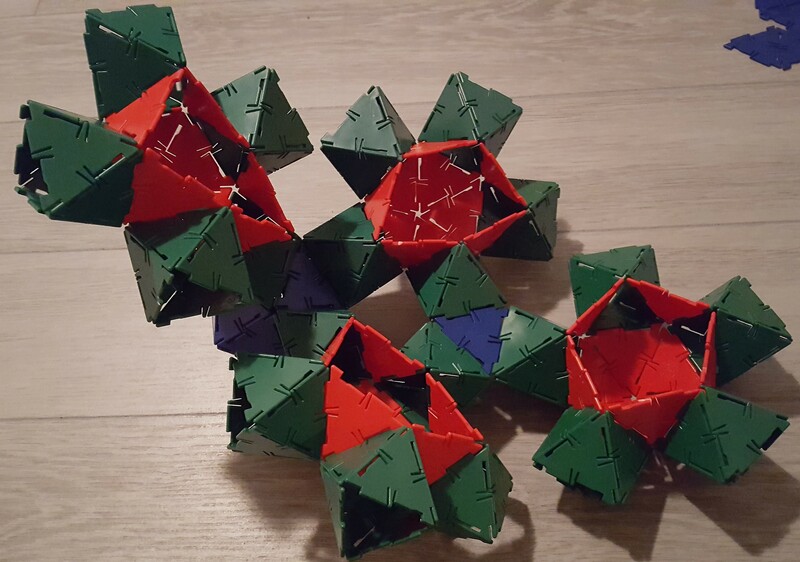 Thus, there are 32 icosahedra and 60 octahedra. 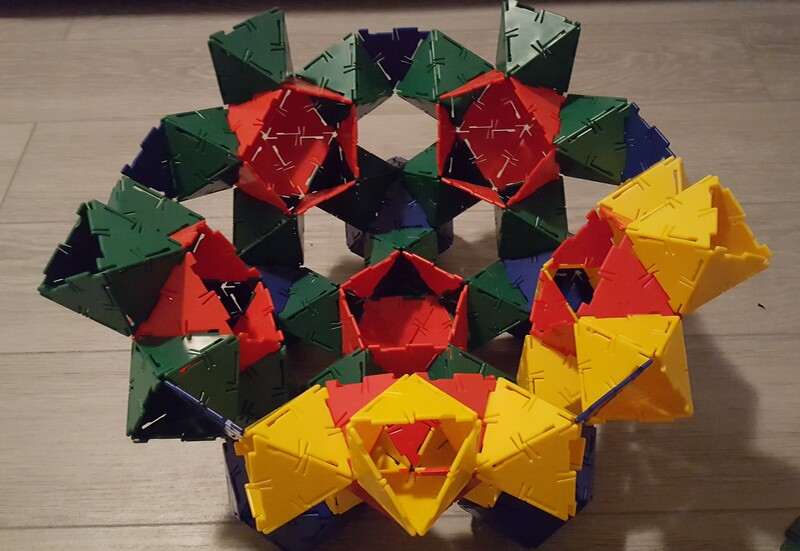 Even though we don’t use the faces at the junctions between the components (so the tabs from each missing face can engage with each other), there are still 20 icosahedra that use 17 triangles, 12 icosahedra that use 15, and 60 octahedra that use 6 faces each. 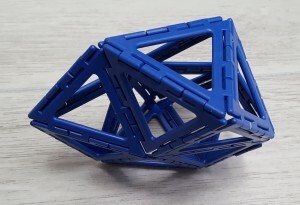 That makes a total of 880 triangles that have to be connected to make this structure. Punching out each of the pieces and folding each of the flaps and then locking them into place was taking me roughly a couple of minutes per piece. So I could project somewhere between 1000 and 2000 minutes (16 to 33 hours) for the whole structure. PolyPuzzle produces beautiful results, but was just too intricate for something on this scale (at my patience budget, anyway). 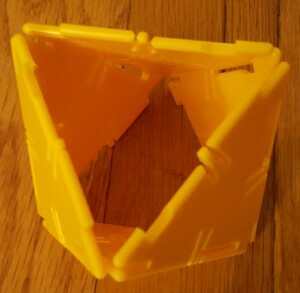 The next possibility that came to mind was the classic geometric toy, Polydron. This toy consists of polygonal tiles with interlocking edges that create a sort of hinged connection between adjacent pieces. 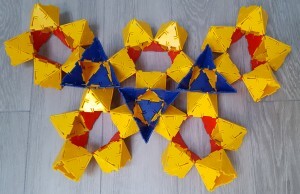 For example, here are six triangles in a row, which wrap around very nicely to allow the two ends to attach, producing the octahedron at left (with opposite faces missing) to be used as a connector. Did I mention we need 60 of those? 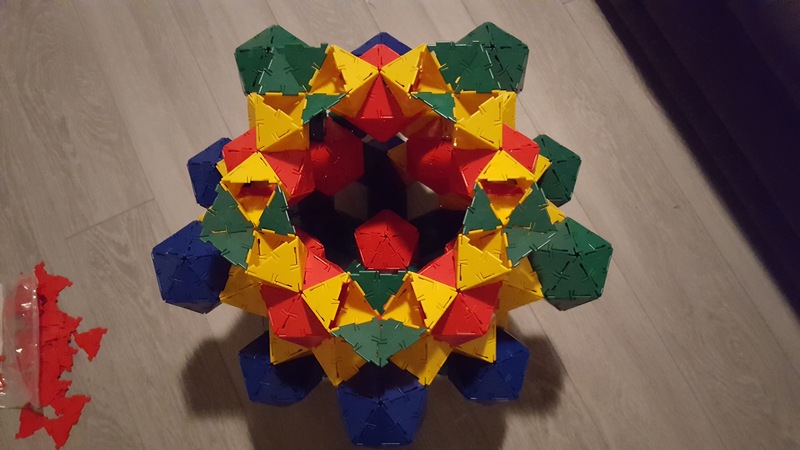 The next step was to assemble some of the pentagonal faces of the excavated dodecahedron. 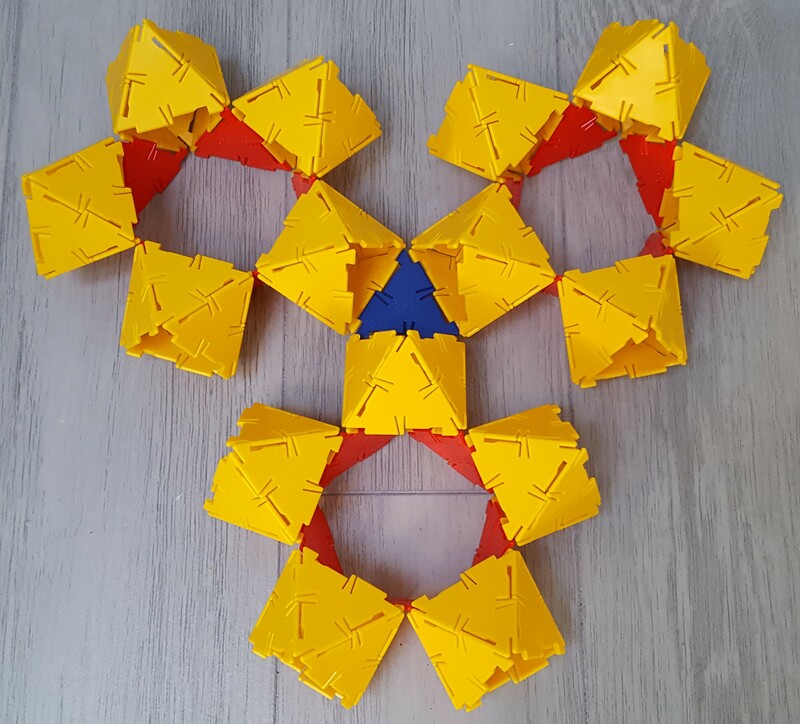 Since with the Polydrons you can’t reach inside of structures once they’re built, it seemed like it might be best to make these rings of octahedra connected by triangles — the red triangles would eventually become part of the face-central icosahedra. Checking back on the statistics, we’d need 12 of those. Next it was time to start connecting those rings. 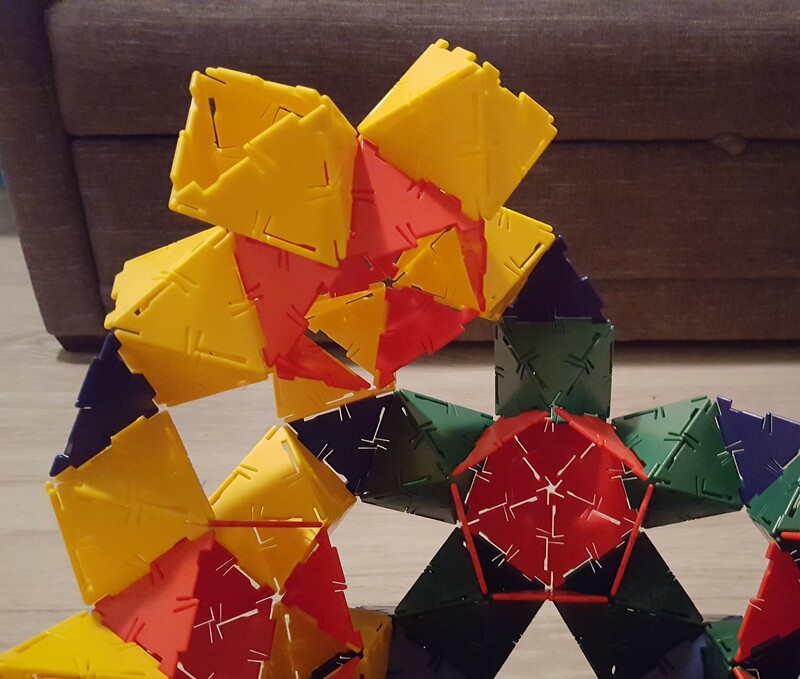 Three of them come together at each vertex of the overall dodecahedral structure. For a while things seemed to be going pretty well with just connecting three of the rings at each eventual junction, like so. But shortly after the above picture, the whole structure became hopelessly floppy and started to disconnect at numerous junctions as it wobbled apart. So for a second try, I filled in more of each icosahedron before proceeding with its neighbors, leaving off just a spot for an eventual “cap” of five triangles. I could add on that cap to complete it. 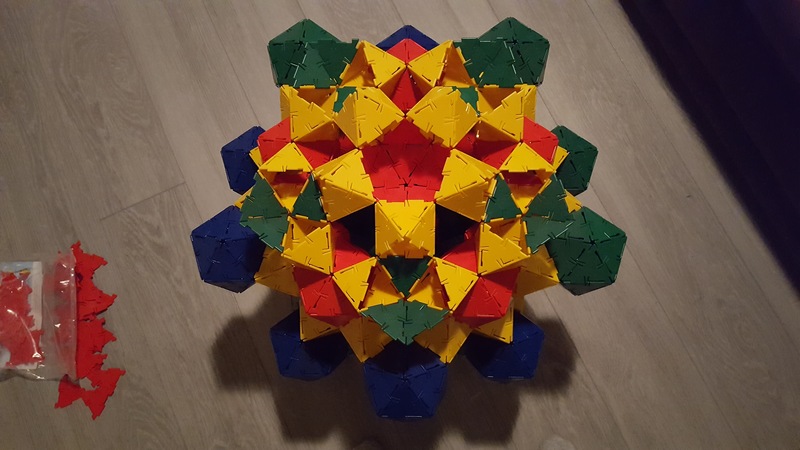 At this point it was stable enough to start adding a second tier of the five-way icosahedra. Things now proceeded pretty steadily. Here is the model with three icosahedra in the upper tier, and more of the ones in the first tier capped off. And here we are just before and after adding the final five-way icosahedron at the top of the structure. 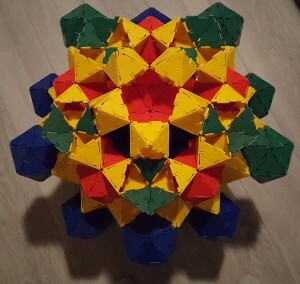 All that remained was to cap off that last central icosahedron, and finish off the five green icoshedra surrounding it. 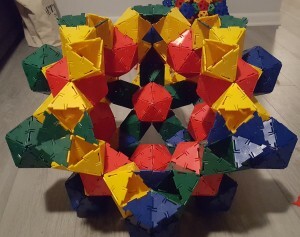 Unfortunately, while performing what by that point seemed like routine connections within the first of those five icosahedron, some connection in the lower tiers gave way under the accumulated weight of the model. That rip set off a chain reaction of self-disassembly, leading to various strips of Polydrons on the floor and a seriously disrupted structure. So, despite coming close, it seemed as though this medium for building the model wasn’t going to work, either. I’d need to find some other means of building it… leading to the subject of next week’s column. As a footnote, though, I do want to say that it’s possible that someone aware of the potential collapse near the end and working with sufficient delicacy could get the full excavated dodecahedron to hang together with Polydron. 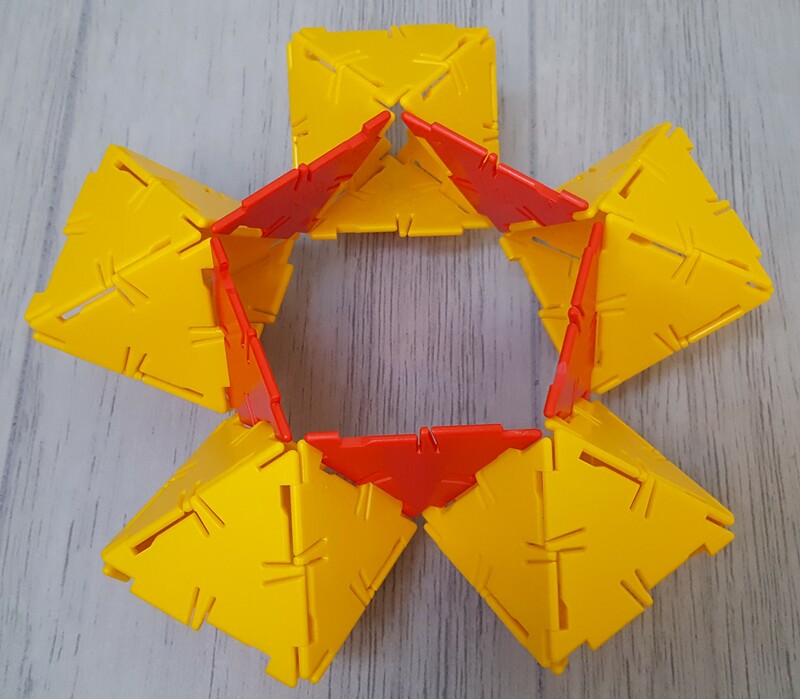 Moreover, Polydron does also offer framework pieces like these, which are significantly lighter, and I don’t doubt that with a sufficient supply of framework pieces it would be possible to assemble this entire structure.